Black Friday already?! Don’t worry: we’ve got you covered. 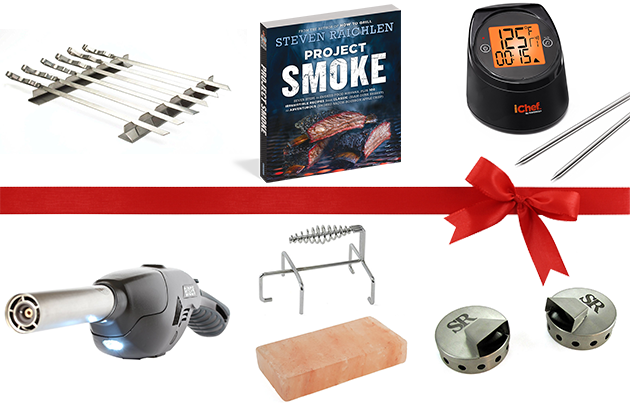 The BarbecueBible.com staff has assembled a dozen recommendations for delighting the griller or barbecuer on your gift list this holiday season. Remember: if they grill better, you eat better. Win–win for all. 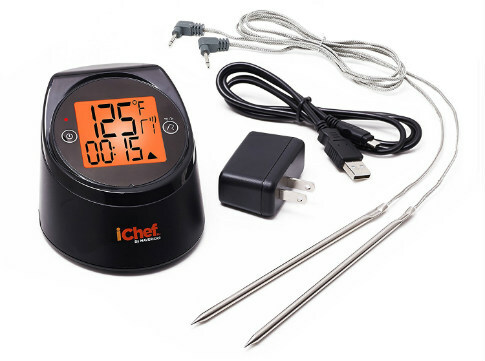 iChef ET-736 Wi-Fi Thermometer: The ability to gauge doneness is key to great grilling or smoking. This Wi-Fi-compatible digital thermometer with dual probes, the latest from Maverick, syncs with your phone or tablet to monitor the internal temperature of meat. Program your target temperature and receive an alert when it’s reached. (Both the thermometer and your phone or other device must be connected to the same Wi-Fi router.) The probes can withstand temperatures up to 716°F, meaning they’re safe to use in closed grills, smokers, or home ovens. You’ll never overcook the prime rib again. $149.99. Best of Barbecue Kebab Rack with Skewers: In many parts of the world, kebabs are cooked on grateless grills called mangals. Emulate the set-up on your own grill with this kebab rack: It raises the skewers above the grill grate to give you picture-perfect kebabs. (Especially useful for ground meat or fish kebabs, which are prone to sticking on a conventional grate.) The stainless steel rack comes with six 17-inch sword-like skewers whose flat design prevents foods from spinning when they’re turned. $18.99. 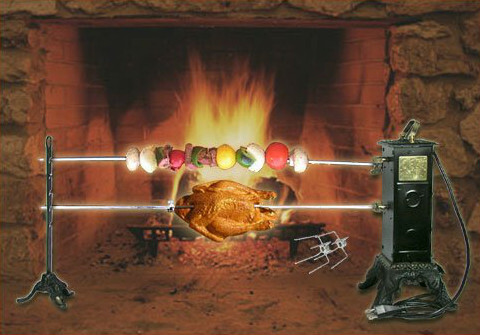 SpitJack Electric Fireplace Rotisserie: Resurrect the lost art of fireplace cooking with this handsome cast iron and brass electric rotisserie. The antique-looking SpitJack comes with two spits which rotate independent of each other. Roast meat, poultry, fish, or vegetables right on the hearth. Requires a 110V outlet nearby. $329.00. 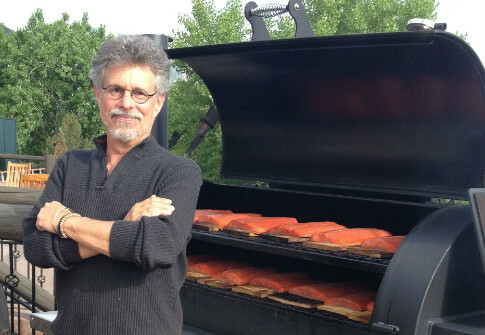 Project Smoke and Best of Barbecue Smoking Pucks: Released in May 2016, Project Smoke by Steven Raichlen (Workman) quickly became a New York Times bestseller, featuring full-color photos throughout and over 100 irresistible recipes. Bundle it with innovative Best of Barbecue Smoking Pucks. These stainless steel disks (a set contains two) hold either pellets or smoking wood chips. Directional vents enable you to direct smoke onto the food, ramping up the flavor. $12.99. Wüstoff Gourmet Brisket Slicer: Large slabs of meat—make that packer briskets—can overwhelm conventional knives. But the 14-inch hollow-ground blade on this baby ensures you can slice through brisket, whole hams, and shoulder clod with ease. Well-balanced with a comfortable tripe-riveted poly grip, this knife is made by a German company that’s been manufacturing cutlery for more than 200 years. $119.95. 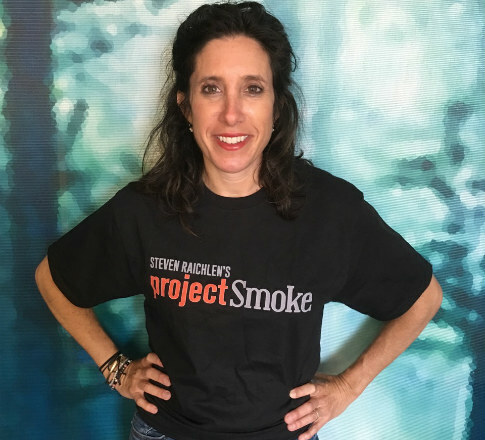 Project Smoke T-Shirt: Wear the same T-shirt as the crew of Project Smoke on American Public Television. Made from heavyweight 100 percent cotton, the shirt is double-stitched at the hem and sleeves for durability. $22.95. Yes, we also sell the hat. 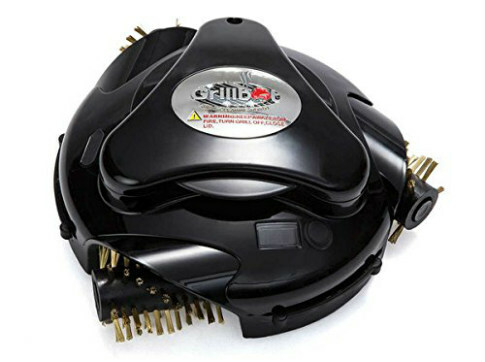 Grillbot Automatic Grill Cleaner: “I love to clean the grill grate,” said no one ever. Enter the Grillbot, a nifty little machine that motors around on the inside of your grill while you do more interesting things. Brass-bristle brushes on the underside of the Grillbot attack crusty grill grates and smoky residue with vigor. Can be programmed for 10, 20, or 30 minute cycles. Compatible with most grills on the market, it comes with a rechargeable lithium-ion battery. $99.95 with current 25% off sale on Grillbots.com. Himalayan Salt Brick and Press: For foods with subtle but incomparable flavor, cook them on a grill and press with a rectangular block of mineral-rich Himalayan salt. (The specially-designed press holds the block and provides leverage so the food makes maximum contact with the grill grate and the salt.) One of my favorite dishes using this method is pollo al mattone (chicken under a brick). For a recipe, click here. The brick ($39.99) and press ($19.61) are sold separately. 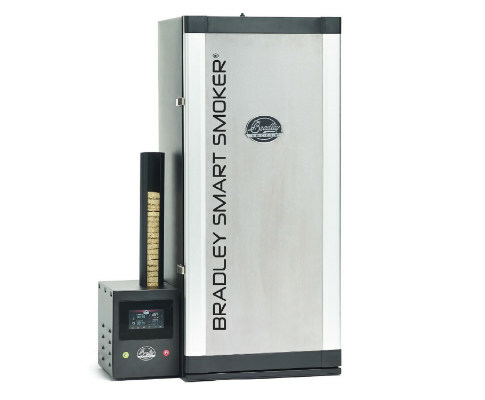 Bradley BS-916 Digital Bluetooth-Compatible Smart Smoker: The latest in the Bradley line of smokers, this smokehouse is not only 40 percent larger (it can accommodate up to 10 racks of food), but features iSmoke technology that enables you to monitor temperatures inside the unit from your smartphone. Like its predecessors, the Smart Smoker is incredibly easy to use and requires very little attention, even during long cooks. Two separate heating elements maintain the temperature and regulate the smoke output. Small disks of compressed wood and sawdust (called “bisquettes”) provide the smoke. $651.50. 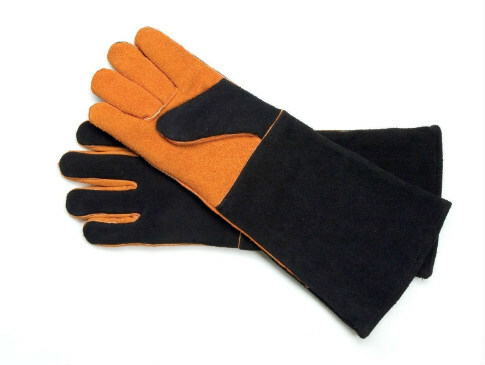 Suede Grilling Gloves: A perennial bestseller in the Best of Barbecue line, these distinctive black-and-rust-colored suede grilling gloves are long enough to protect your forearms from the heat of the grill, but soft and pliable enough to wear in comfort. Bundle with my Insulated Food Gloves, rubberized gloves that help you maneuver beer-can chicken off the grill, shred pork, or handle other hot foods without discomfort. Priced at $16.44 and $7.39, respectively. Bison Airlighter: The cool factor is off the charts for this flame torch and blower. Light fires in a fraction of the time of conventional methods. The unit is cordless and is fueled by butane. (One fill sponsors about 15 minutes of burn time.) Includes a dual-bulb flashlight, air-cooled barrel, a bottle opener, and safety locks. $89.99. 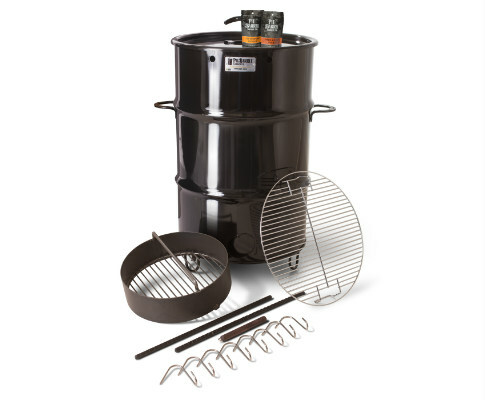 Pit Barrel Cooker: One of the simplest and most affordable grill/smokers on the market is also one of the best: I debuted the Pit Barrel Cooker—known in barbecue circles as the PBC—at Barbecue University several years ago and haven’t looked back. The PBC starts with a new 30-gallon drum powder coated with porcelain enamel. The charcoal basket holds 8 pounds of charcoal, enough for a 7- to 8-hour cook without refueling. Food can be hung from rebar rods with stainless steel hooks or arranged directly on the hinged grill grate. Shipping is free on orders placed within the continental U.S. $299. Barbecue University™: Give that special griller or barbecuer in your life the ultimate experience: Enroll them in Barbecue University, a 3-day celebration of smoke and fire at the luxurious Broadmoor resort in Colorado Springs, Colorado. Forbes writer Larry Olmsted called it “one of the best food lover’s events in the nation.” Each day, students will prepare an ambitious menu culled from the world’s barbecue specialties, learning skills and techniques that will serve them for a lifetime. Two back-to-back sessions have been scheduled for June 2017. But hurry: enrollment in each session is limited. Prices start at $2,300. Also check out our Holiday Gift Guide for Foodies.